Erdogan slams student death 'silence' Jump to media player Turkey's President Recep Tayyip Erdogan has criticised US leaders' responses to the murder of three Muslim students in North Carolina. Thousands mourn Muslim student deaths Jump to media player Thousands of mourners have gathered for the funeral of three Muslim students killed in North Carolina. US student killings spark anger Jump to media player The killing of three Muslim students in North Carolina has prompted anger in their community, and online. A look back at Turkey's turbulent year Jump to media player The BBC's Mark Lowen looks back at a turbulent year in Turkish politics and what it means for democracy in the country. Turkey's President Recep Tayyip Erdogan has criticised US leaders' responses to the murder of three Muslim students in North Carolina. 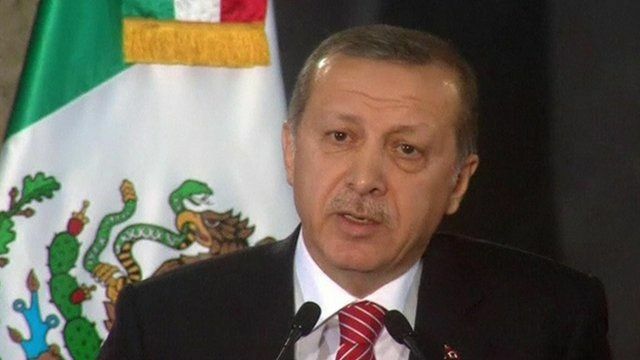 Speaking on a visit to Mexico, Mr Erdogan said he had called US President Obama, Vice-President Biden and Secretary of State John Kerry about the deaths, and criticised their "silence" on the case. More than 5,000 people attended the students' funeral on Thursday. Initial indications are that the gunman, Craig Hicks, acted in a dispute over a parking space, but the victims' family claims it was a hate crime.